Rollerblade Astro 90 Men - the new 90 mm inline skate with Alu frame, SG9 bearings, power strap - speed laces and a "5 Star Fit" liner which ensures the perfect fit. 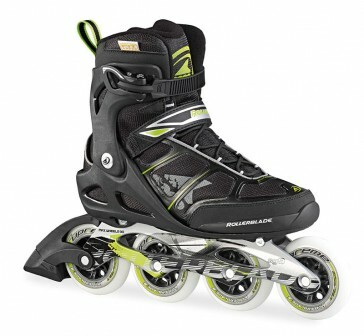 The new Training and Fitness Inline Skate Rollerblade called Astro 90. Visually and technically know this skate to impress. Starting with the high-quality aluminum frame and 4x 90mm / 85a wheels with SG9 bearings, on the super comfy "5 Star Fit" soft boot liner and the power strap quick lacing. There were, as always, the most important factors considered - stability, good fit, high speed. The stability is achieved by the high cuff. The good fit of the generated 5 Star Fit liner. For high speeds, the 90mm wheels combine with the SG9 bearings.